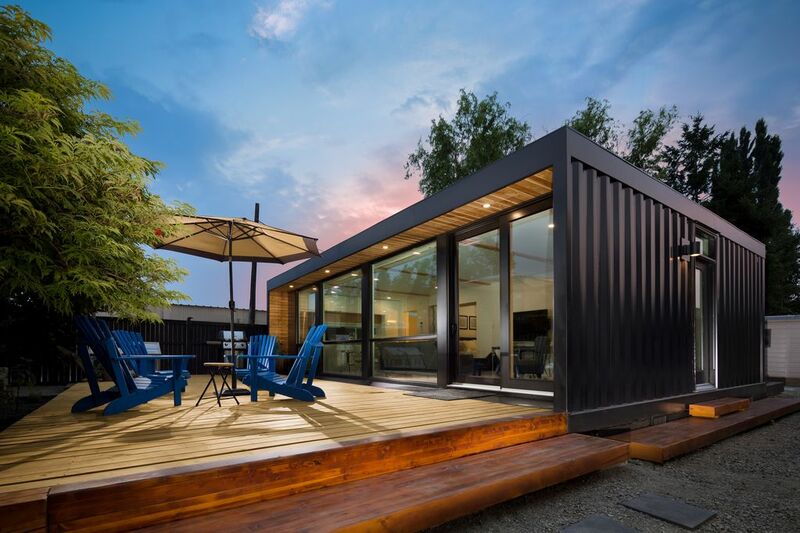 This is a new bright, open modern concept container home centrally located in Kelowna. The home has a total Glass frontage with large deck for entertaining. All the comforts of home with modern appliances, laundry and BBQ. The home has 2 bedrooms with queen beds and a pull out couch single bed. (We also offer by hourly rental a beautiful Ski Boat and driver with wakeboards, surf boards and tube to enjoy lake Okanagan) Ideal for vacationers, adventurers, and extended stay corporate travelers. Great for "runcation" marathon participants. Our family has enjoyed living in the beautiful Okanagan for 11 years, we enjoy all that Kelowna has to offer: hiking, biking, golfing skiing, boating, and of course the great wineries! There is so much to do all year round. We hope you come visit! The Okanagan has so much to offer and Kelowna is the ideal place to stay as it has great beaches, a beautiful lake, great hiking, golfing, world class ski hills, and many wineries. Kelowna is close to many of the beautiful areas such as Peachland, Summerland, Penticton, Naramata, Osoyoos, great day trips to see more. Our home in Kelowna is centrally located, close to bike and hiking trails. It is a short walk or drive to all the downtown shopping areas such as Bernard, Pandosy and Water Street. This home has a total glass frontage that opens up to a beautiful large entertaining deck. A great spot to enjoy your meals and hang out. Other amenities: 3 Bikes available at property for use. Golf clubs available by request, A beautiful luxury Ski Boat, driver, wakeboards, tubes, surf boards etc. available by request with owner. Brand New Modern open bright Kitchen, equipped with everything you would need! We absolutely loved our stay! We are repeat guests. We spent 3 days in the Kelowna area at this beautiful container home. It was perfect for 4 girls touring wine country. Randy picked us up from the airport and gave us a tour of the town. He also took us on a wine tour of the Penticton area. He has great recommendations for food and drink. Next time we come back, we want to check out the baby kangaroos! I can't wait to come back and drink more amazing wines as well! A lovely experience in a quiet industrial area just a 20 minute walk downtown. Suited our needs to a T.
What a gorgeous little place; immaculately done and maintained, this was perfect for our stay in Kelowna. Close to shopping, restaurants, and the waterfront, yet very quiet location. Randy provided great information on local establishments and things to do in town, and was very responsive to any questions we had. Highly recommend! This rental is unique. The concept is intriguing. The decorating is very efficient in its simplicity. ALL the comforts of home have been provided. The cleanliness is exceptional. The hosts were very friendly, helpful and a wealth of information. This was our first time not using a chain hotel and it turned out to be an excellent experience overall. The only possible problem might be unavailable dates due to increased popularity. We have already recommended to family & friends. Will have to remember to book early! There will be a next time. Thank you for everything! My wife and I really enjoyed this unique house. Although we had seen pictures of houses built from shipping containers -- we had never stayed in one. Love that "window wall" which lets in tons of light on the north side. Very comfortable. Lotsa of counter space (except in bathroom where the sink is elevated). Also a ton of storage space if you want to put away your things. Big screen TV works well. This home is an impressive demonstration of how comfortable smallish spaces can be if carefully thought out. It was our favorite place of the whole trip. I hadn't been to Kelowna in years and it has grown !! wow, now about 135,000. If you like to shop -- you will have plenty to explore. We found Knox Mt Park a few minutes away which has good hiking and expansive views of the area. The award for the most "over the top" winery that I have ever been too is about 25 minutes away -- Mission Hill. Can't vouch for the wines as I am interested only in architecture ......but the buildings will likely remind you of a fortress with maybe Stonehenge around the corner......or a French king. Summerhill Winery on the east side of the lake has an unusual history involving a pyramid....... MEC has a nice size store close by ( in Orchard Park ) if you need outdoor gear.